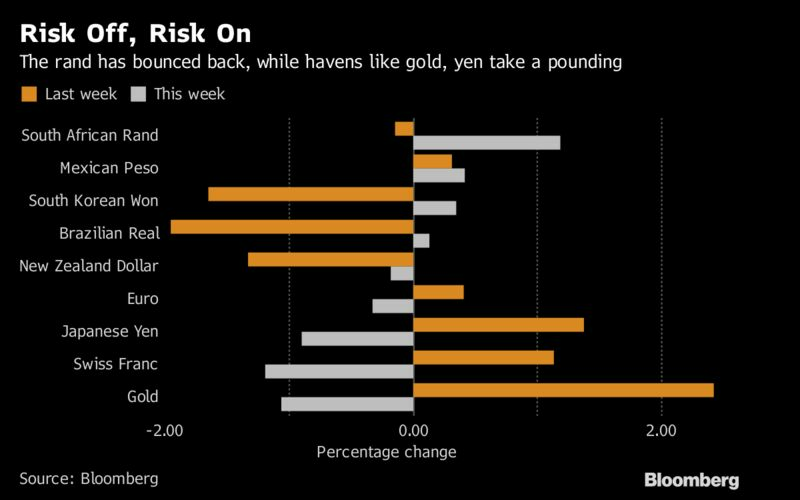 Traditional haven assets including gold and the yen slumped and core bonds across Europe declined with Treasuries as the prospect of war between the U.S. and North Korea receded. The dollar extended its advance as European stocks struggled for traction following Monday’s strong gains. The greenback climbed a second day after comments from Federal Reserve Bank of New York chief William Dudley signaled another interest-rate increase this year is in the cards. The Stoxx Europe 600 Index edged higher after the German economy extended its growth spurt in the second quarter though at a slower pace than expected. The British pound tumbled to a five-week low after U.K. inflation unexpectedly held steady in July, clouding the outlook for rate increases, while oil halted a slide below $48 a barrel. Meanwhile, data showed Germany’s economy expanded 0.6 percent in the second quarter, driven by domestic demand. That missed estimates slightly, but was accompanied by a revision in the first-quarter number. The euro retreated. A crowded U.S. data docket will give some indication of whether second-half GDP will outperform the first half. July retail sales are expected to rise from June, while housing starts and industrial production may be muted. On Wednesday, the Federal Open Market Committee will issue minutes from its July policy meeting that may hold clues to the Federal Reserve’s next rate hike. The same day, euro-area second-quarter GDP data is due. Chinese tech titans Tencent Holdings Ltd. and Alibaba Group Holding Ltd. are among the companies reporting results this week. The Stoxx Europe 600 Index added 0.1 percent as of 10:38 a.m. in London. The MSCI All-Country World Index declined less than 0.05 percent. Germany’s DAX Index jumped 0.3 percent, as did the U.K.’s FTSE 100 Index. Futures on the S&P 500 Index increased 0.2 percent. The euro decreased 0.2 percent to $1.1754, the weakest in a week on a closing basis. The Bloomberg Dollar Spot Index advanced 0.2 percent to the highest in three weeks. The British pound weakened 0.4 percent to $1.2914, the lowest level since July 13. The yield on 10-year Treasuries advanced three basis points to 2.25 percent. Germany’s 10-year yield gained two basis points to 0.43 percent. Britain’s 10-year yield climbed three basis points to 1.01 percent. Gold fell 0.6 percent to $1,274.97 an ounce. West Texas Intermediate crude gained 0.2 percent to $47.70 a barrel. Japan’s Topix index finished the day 1.1 percent higher and Australia’s S&P/ASX 200 Index gained 0.5 percent at the close. Hong Kong’s Hang Seng index dropped 0.3 percent as the Shanghai Composite Index rose 0.4 percent. Markets in South Korea and India are closed Tuesday for holidays. The Japanese yen fell 0.7 percent to 110.41 per dollar, the biggest drop in three weeks.